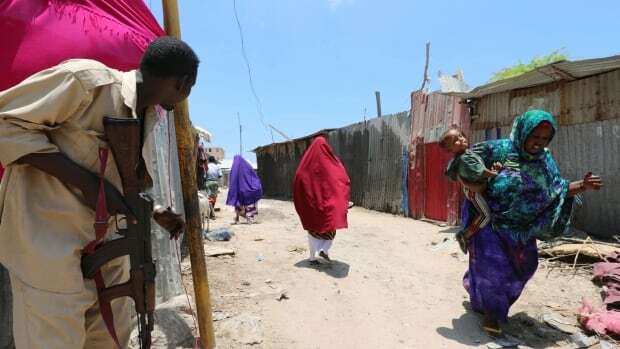 Somali security forces were exchanging gunfire with at least five attackers and trying to rescue public servants trapped inside the Mogadishu building, which houses the ministries of labor and works, police Capt. Mohamed Hussein said. At least five gunmen stormed the building after a suicide car bombing at the gates, according to police. Al-Shabaab claimed responsibility for the ongoing attack, saying that its fighters were inside the building, which is located not far from the headquarters of the Somali intelligence agency. The al-Qaeda-linked al-Shabaab frequently carries out suicide bombings targeting public places, hotels and government offices. Al-Shabaab, Africa's most active Islamic extremist group, has been fighting for years to take power and create an Islamic state in Somalia. African Union peacekeepers stationed in Mogadishu and elsewhere in the country have helped Somali forces to keep al-Shabaab fighters at bay. The U.S. military has carried out a number of deadly airstrikes in recent months against al-Shabaab.